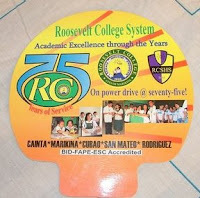 Roosevelt College is one of the popular and leading schools in Marikina. A couple of my cousins studied there. I only knew of the Cubao, Cainta and Lamuan Marikina branches. I only discovered recently that they have branches in San Mateo and Rodriguez as well. 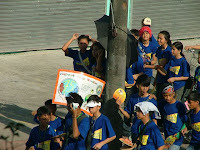 A few days ago, a huge number of students and faculty from all the Roosevelt schools paraded in front of our house marching towards the main campus in Cainta along Sumulong Highway. 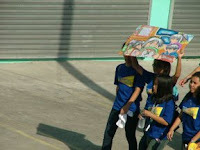 Roosevelt was celebrating their 75th year of academic service. 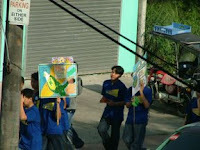 Students holding banners and placard drawings depicting "save the earth" drawings and "75th anniversary" were evident. A tired band also passed by with the drummer being the only evident and audible sound left. 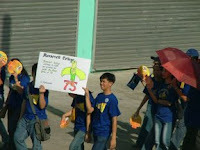 Happy 75th Foundation Day Roosevelt College ! Happy 50th Anniversary Lego ! Have You Hugged Someone Lately ?